The EMC2-Z7015 single-board computer (SBC) from Sundance Multiprocessor Technology ñ aimed at embedded multicore and critical applications ñ uses the current generation of the Xilinx Zynq system-on-chip (SoC), integrating dual-core ARM A9 CPUs, four lanes of PCI Express, and reprogrammable logic with Artix-7 FPGA technology. The SBC resides on the ìOneBankî PC/104 form factor. The ARM-9 is clocked at as fast as 1 GHz and is supported by 1 Gb of DDR3, SD card for standalone booting/local storage, USB2.0, HDMI, SATA, and 1 Gb Ethernet interface. The board will run standard Linux application and is supported by the free web edition of the Xilinx Vivado 2015.2 tools. 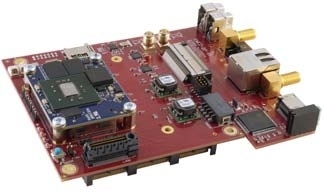 The EMC2-Z7015, although a single-board-computer (SBC) by default, takes advantage of the stackable PC/104 concept that enables multiple SBCs to be integrated into a multiprocessing ARM system, using PCI Express for inter-connection between each Zynq SoC. The Sundance SBC takes the idea of PC/104 modularity even further with its so-called ìcable-less breakout,î which removes the requirement for cabling from the PC/104 board to the external world. The EMC2-Z7015 uses a self-mating connector solution that breaks out the I/O to a low-cost connector board.